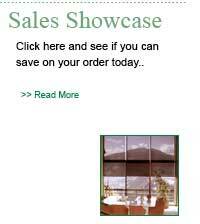 Our best selling fabric, this 3/8" Light Filtering Double Cell Honeycomb Shade fabric will dress up any window. This fabric is available in our broadest of color palette; is made of 100% woven polyester. Fabric is white on the back for a uniform look from the outside. 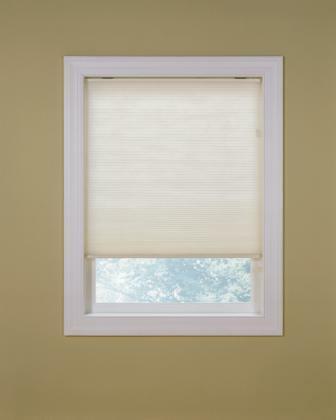 The 3/8" light filtering double honyecomb shade fabric provide excellant insulation with an R Value of 4.6. 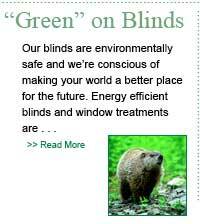 Also known as Cellular Shades, Honeycomb Shades offer great evergy efficiency due to the R Value of the Honeycomb/Cellular fabric. 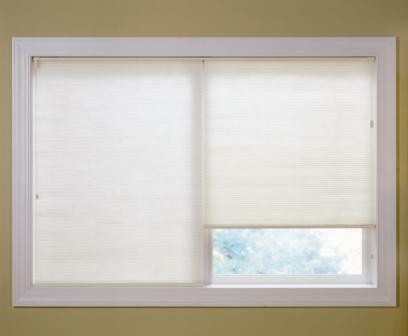 Standard shade control: Traditional cord operated Honeycomb shade that raises from the bottom up and stacks at the top. 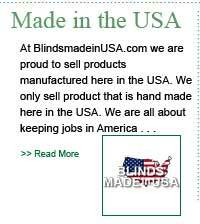 Continuos Cord System: Cord design ensures the shade will open and close smoothly and evenly. The cord is shorter then the traditional dangling cord, making for a neater appearance. A special clutch system keeps the shade at the exact height desired. 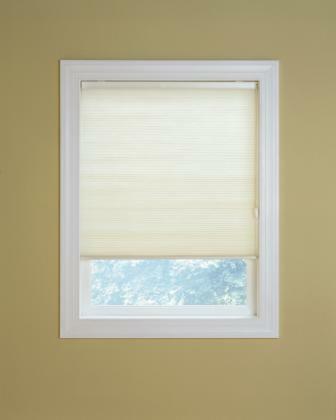 Ideal option for larger shades, eliminating long, cumbersome dangling cords. 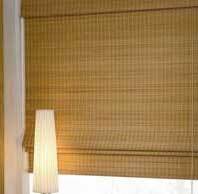 **Some larger shades require the Continuous Cord system or a Two on One Headrail-this is dependant upon style of fabric and size of shade. Deluxe Cordless System: Stylish cordless system eliminates the traditional exposed cord and allows easy adjustment by lifting or lowering the shade by hand. 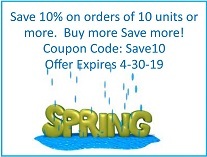 Eliminates danger of dangling cords to children and pets. Also available in Top-Down/Bottom-Up Cordless. Top-Down/Bottom-Up System: This shade can be opened from both the top and the bottom. Right and left hand controls move the middle and bottom rails to raise and lower the shade. This style is ideal for letting natural light in through the top and preserving privacy below. It allows light to flood a room by opening completely from the bottom up. Cordless Top-Down/Bottom-Up System: Convenience of the Cordless feature with the added privacy of a Top-Down/Bottom-Up feature. 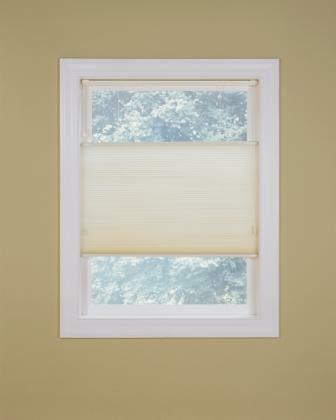 Two on One Headrail: For a very large single window or two large windows side-by-side, this specialty shade provides the appearance of a single shade, with two sections operating independently. Also available with Continuous Cord System. 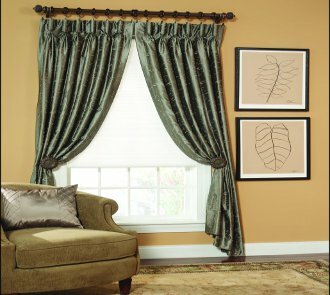 **Some larger shades require the Continuous Cord system or a Two on One Headrail-this is dependant upon style of fabric and size of shade. Continuous Cord System: Cord design ensures the shade will open and close smoothly and evenly. The cord is shorter then the traditional dangling cord, making for a neater appearance. A special clutch system keeps the shade at the exact height desired. Ideal option for larger shades, eliminating long, cumbersome dangling cords. 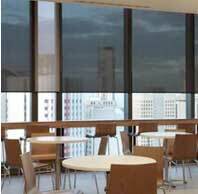 **Some larger shades require the Continuous Cord system or a Two on One Headrail-this is dependant upon style of fabric and size of shade. Inside Mount Deductions for all control types. Fabric will measure ordered width less 3/8"
Headrial will measure ordered width less 3/16"
Outside Mount Deductions for all controls types. No deduction taken on outside mount. Minimum Width 12" Minimum Height 8"
Maximum Width 84" Maximum Length 84"
Rail Measurement: Depth: 1 7/8" Height 1/2"
Minimum inside shallow mounting surface: 1/2"
Minimum inside Flush mounting surface: 2 1/2"
Honeycomb Shades (Standard Control) - Measuring and installation. 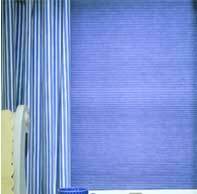 Minimum Width 22" Minimum Length 8"
*Maximum Width and Length is dependant upon fabric choice. Depth 1 11/16" Height 1 5/16"
Minimum Shallow Mounting Surface: 3/4"
Minimum Flush Mounting Surface: 1 3/4"
Honeycomb Shades (Continuous Cord) - Measuring and installation. 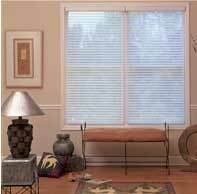 Minimum Width 18" Minimum Height 8"
Maximum Width 72" Maximum Height 84"
Minimum Flush Mounting Surface: 2"
Honeycomb Shades (Cordless and Cordless Top-Down/Bottom-Up) - Measuring and installation. Minimum Width 12" Minimum Height 12"
Maximum Width 72" Maximum Length 84"
Rail Measurements and Mounting requirements are same as Standard shade. Honeycomb Shades (Top-Down/Bottom-Up) - Measuring and installation. 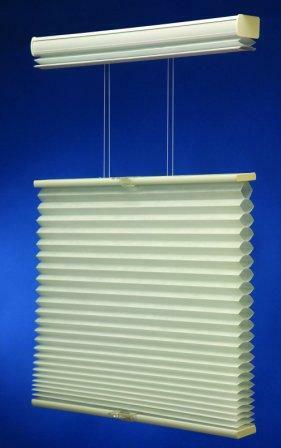 If you like Honeycomb Shades you may want to look at Roman shades. Soft Fabric look with the same functionality as a Honeycomb shade. 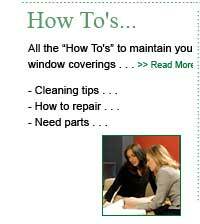 Another option for a higher end look is Sheer Shadings. Soft, voluptious Sheer Horizontal fabric vanes betweens two layers of sheers. This shade lifts up and down like a Honeycomb Shade with the added ability to tilt the vanes open and closed.